Poetry Chaikhana | Emily Dickinson - 'Tis so much joy! 'Tis so much joy! 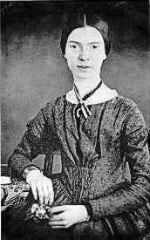 How can someone read this poem and not recognize that Emily Dickinson was a profound mystic (in contrast to the conventional idea that she was a morbid, heart-broken recluse)? "'Tis so much joy! 'Tis so much joy!" What an ecstatic exclamation! The words seem barely able to form themselves in the overwhelm of the experience. What is it that she is talking about when she asks alternately "If I should fail..." and "if I gain..."? It seems to me that she is referring to the exalted state of ineffable joy itself, the surprised recognition that she has entered the heavenly state. The joy mentioned at the beginning is also the heaven with which she closes the poem. This is what she has "gained" by venturing "all upon a throw." She is stunned by her success, she hesitates to believe it is even possible, since she humbly admits that she is "poor" and imperfect. Failure, to her, would be to not remain in this state of ecstatic communion. But she strengthens her determination to attain "Victory" by recognizing that she has nothing else to pursue and nothing to avoid, nothing to desire or to fear. "Life is but Life! And Death, but Death!" Things are simply as they are and the mind need not project false judgments of 'good' and 'bad' on them, even on "Defeat." Just to have gotten as far as she has, even if she ultimately "fails," she has tasted that ethereal sweetness. So why fear failure? "For Heaven is a different thing, / Conjectured, and waked suddenly in --" With those lines, she is, in her quiet way, declaring that she is directly experiencing heaven in that moment and not indulging in mere imagination. She proclaims that heaven is a very different experience than what is "conjectured" or commonly imagined once you actually awaken into it. The authority of these lines is unmistakable. The final line, that the joy of heaven "might extinguish me," could just as well have been written by Rumi or St. John of the Cross. And, of course, that is the way to final "Victory": By releasing the little self, the ego, into that rising joy, the true Self, the divine self, is born.